The Head of Iran's Foreign Policy Strategic Council referred to US pressures on Iran saying that most of the countries in the world are against US anti-Iran policies. 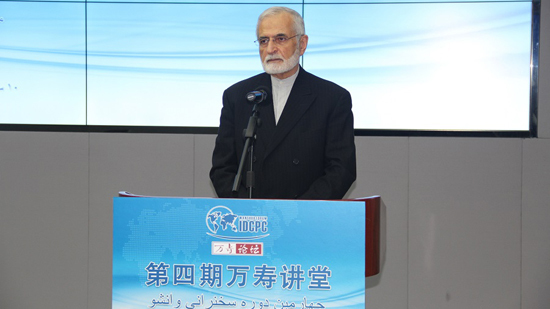 The US is following its goals through use of force, bullying and threat, Kamal Kharrazi said addressing Iran foreign policy meeting held in Beijing International Studies University Monday night. US pressure is aimed at changing regime in Iran, he said, adding that Iran will not hold any negotiations with the US unless it stops threatening and bullying the Iranian government and people. 'We are sure that we will be able to stand up to these threats with assistance from friendly countries, he added. They pretend that Iran, China, Russia and also European countries are posing threats to the US, believing that political and military activities of other countries and their regional influence should not impede US hegemony in the world, Kharrazi noted. Iran's policy is to come closer to other countries especially Russia, China, India and Europe against US polices, he said. Elsewhere in his remarks, Kharrazi referred to Iran nuclear deal also known as the Joint Comprehensive Plan of Action (JCPOA) as an important issue in Iran's foreign policy and in political, social and economic affairs of the country. Director General of the International Atomic Energy Agency (IAEA) Yukiya Amano in a statement on Monday announced that Iran has complied with its commitments under the JCPOA. 'Iran is implementing its nuclear-related commitments under the Joint Comprehensive Plan of Action. It is essential that Iran continues to fully implement those commitments,' the statement read. The US has not only left Iran deal but is forcing other countries to join US in putting pressures on Iran by imposing secondary sanctions, Kharrazi said. After Washington's May 8 exit from the historic Iran Deal, the US gave 90 to 180 wind-down period to other countries before it starts re-imposing oil sanctions on Tehran on November 4. Trump also said he would reinstate the US nuclear sanctions on Iran and impose “the highest level” of economic bans on the Islamic Republic.